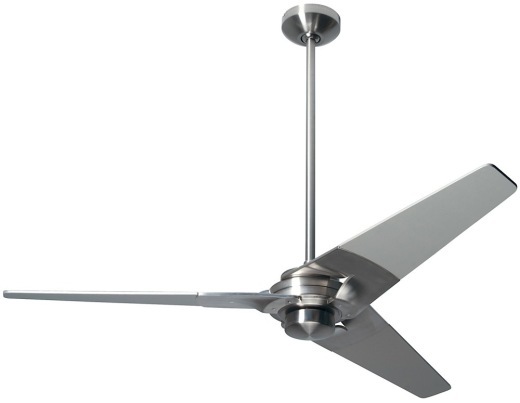 Torsion Fan Brushed Nickel - 52"
The Torsion ceiling fan by the Modern Fan Company is a contemporary marvel. 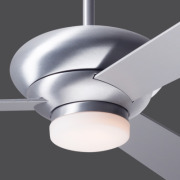 With a distinctive styling and three contemporary blades, the Torsion ceiling fan is a beautiful fan for your home or business. With three sizes available, 52" or 62". Light kit adaptable. Includes 5" and 17" downrods for 12" or 24" overall length. Additional downrod lengths available. Mounts on any ceiling slant up to 33 degrees. Airflow is 6247 cubic feet per minute. For full information, download the specification sheet. This fan is rated for dry and damp locations. Please download information about hanging this fan in damp locations. Includes 001 wall control for fan speed only.